“Yeshi” is still trying to come to terms with the trauma of discovering the body of her son being carried through the streets of the Ethiopian city of Ambo. A 27-year-old rickshaw driver, he had been caught up in deadly protests between the police and students in the city in April. 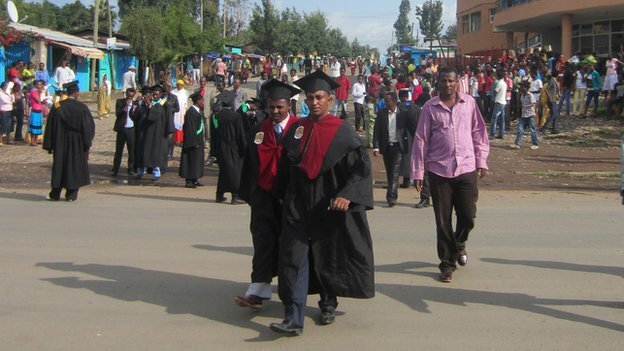 They were demonstrating about plans to extend the administrative control of the capital, Addis Ababa, into Oromia state. 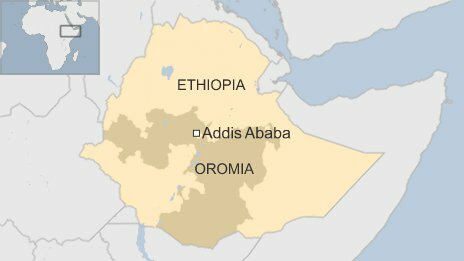 Oromia is the country’s largest region and completely surrounds Addis Ababa – and some people feared they would be forced off their land and lose their regional and cultural identity if the plans went ahead. The government says the “Masterplan”, as it is known, would allow them to better extend city services to rural areas. However for Yeshi – who asked for her name and those of her family to be changed – the heavy-handed response by the security forces that saw her son shot in the head is hard to fathom. She had come across a group of people carrying a body and overheard people saying it was her son, Tamiru. Unable to recognise his features as they were too disfigured, she identified him by his “clothes and shoes”. “I think they were killing people on purpose,” she told the BBC, saying that Tamiru was not directly involved in any trouble that day. Five other young people were also killed with bullet wounds to the head, she says. One of her other surviving sons, Ibsa, said he was unable to believe that his brother was dead and asked for the coffin to be opened. “His head was blackened and torn apart. The bullet had gone through his temple. You couldn’t identify him by his face but I recognised his body,” he said. Three months later it was a very different atmosphere in Ambo, which is about 125km (77 miles) west of the capital and was the focal point of the protests. When the BBC team visited, it was in the middle of the graduation season and the area around the university was full of graduates in their gowns and caps ahead of their big ceremony. Students were posing for photographs with armfuls of red roses wrapped in cellophane and the mood was one of celebration. 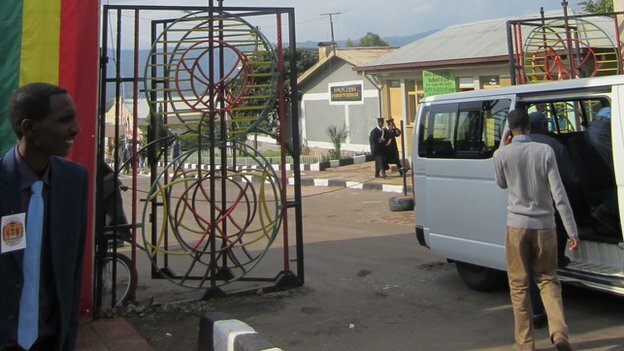 Yet this was the same place – the main entrance to Ambo University – where witnesses say the protesters and police clashed in April. The government says that 17 lives were lost in the violence. Opposition, human rights groups and some eyewitnesses say the figure is much higher. Ethiopia’s Information Minister Redwan Hussein old the BBC the dead included five students and 12 civilians and strongly denies that the government was responsible for any of the violence. The protest was hijacked by “rabble rousers” with a political agenda – “hell-bent on raising havoc”, he said. “They were shooting, they had guns – ammunitions,” Mr Redwan said. He dismissed accusations from international human rights organisations that police and government security forces shot at unarmed protesters. The students, the minister added, had a right to ask questions about the “Masterplan” and that the government was “ready to discuss” it with them. Mathewos Asfaw, general manager of the “Masterplan”, told the BBC that the demonstrators had completely misunderstood the project and that no-one would be forced off their land. Ethiopia is no stranger to accusations of intolerance when dealing with its critics and opposition groups. The UN Human Rights Council recently recommended that the country improve on its media freedom and pay more attention to human rights. Mr Redwan says he has “no objection” to the recommendations as they are already “being implemented”. This is no consolation for Yeshi, who remains dressed in traditional mourning clothes. Ambo Protests: Spying the Spy? UK accused of complicity in extraditing Ethiopian opposition leader facing Death Penalty. Posted on 28th July 2014 by newsafrica. 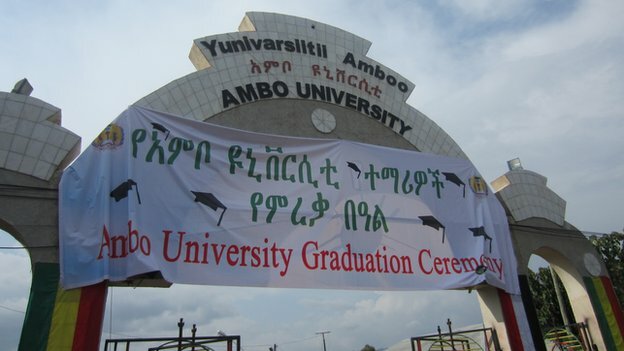 This entry was posted in Africa, Ethiopia, Human Rights Violations and tagged Addis Ababa, Ambo, Ambo University, BBC, Ethiopia, Oromia, Oromia Region, Student. Bookmark the permalink.